If you are looking to upgrade your generic MP3 player listening experience, the Logitech MetroFi 170 and 220 earphones may be ideal for you. The new MetroFi 170 and 220 earphones are the noise isolating earphones that able to deliver customized comfort for perfect listening music on an iPod by creating a “magic” seal between your ear and outside world. Both MetroFi 170 and 220 are able to provide 16dBs of noise isolation. The MetroFi noise-isolating earphones are using silicon ear-cushions which are soft enough to conform the unique shape of the ear canal and create exceptionally accurate sound quality. 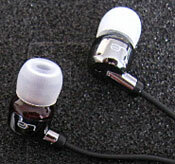 MetroFi 220 features with a titanium-coated speaker for more detail in high frequency as compared to 170. Both Ultimate earphones also available in vi models that featuring an integrated microphone for calls with remote button and basic playback control. Logitech MetroFi 170 and MetroFi 220 Ultimate Earphones will be available in February for $50 and $80, respectively; the vi models will sell for $10 more.